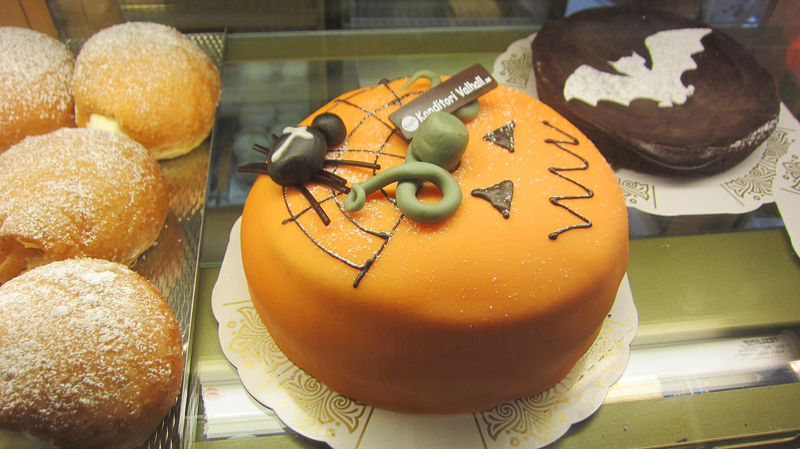 What is Halloween like in Sweden? It was basically imported from the U.S. and started to catch on during the 1990s. But with the exception of a minimal event at a local park, some random jack-o-lanterns, and bakery and flower shop displays it definitely doesn’t compare to the hype it receives in the U.S. There are two reasons I think it may flounder in popularity (three if you count that it’s an imported celebration, that is a tough sell in itself). First, Halloween falls very near the Alla Helgons Dag (All Saint’s Day) which is the first Saturday in November and is a day of remembering the dead. Many people visit cemeteries and lay candles on the graves of their deceased loved ones. It’s a very beautiful occasion that doesn’t quite mesh with dressing up in a costume and bobbing for apples. The other reason is that there seems to be a misunderstanding among many Swedes regarding the costumes. Most Swedes I have spoken with are under the impression that on Halloween people dress up in horrifying, scary costumes and go out and play tricks on people like throwing eggs. It’s interesting that perception exists since in the U.S. Halloween is really a free-for-all in terms of costumes and I would venture to say that the vast majority of costumes, particularly for children, are quite the opposite of scary and the choices are limitless from being a princess, to a bunch of grapes, to a zipper. 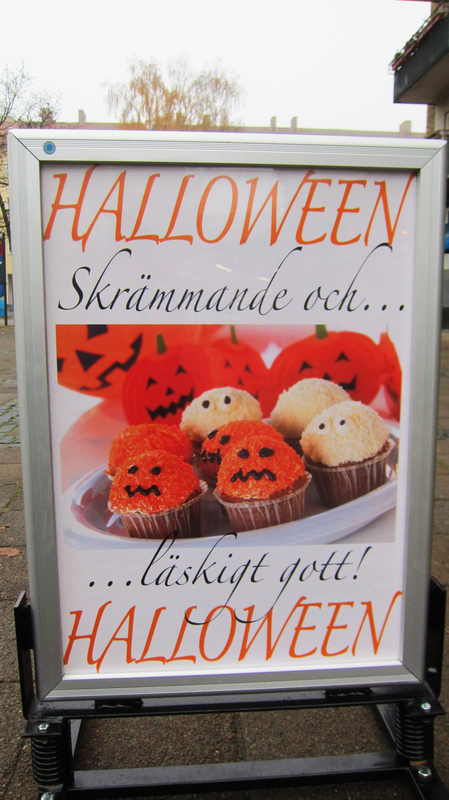 You can begin to understand the dislike many Swedes may have for Halloween if they think it’s all about blood and gore, zombies, grim reapers and pranks. The history of Halloween is rooted in the Celtic festival of Samhain. The Celts recognized November 1st as their New Year and October 31st was the night when the veil between the living and the dead was the thinnest and ghosts returned to earth. People dressed up in costumes and lit bonfires. All Hallow’s Eve was brought to the U.S. by Irish immigrants in the 1840s and evolved into Halloween as we know it today which is about the fun of creativity, getting together, and trick-or-treating. Few people know much about it’s origins. 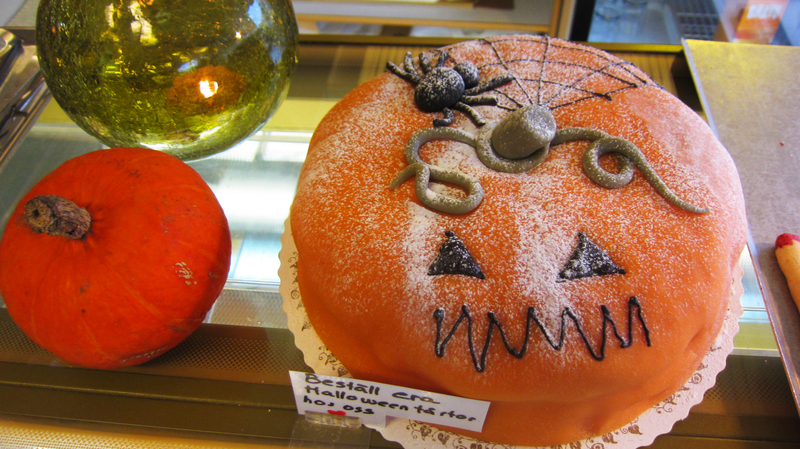 Although Halloween isn’t a raging hit in Sweden, there is still some celebrating going on. Trick-or-treating isn’t common but some people organize their own trick-or-treating and groups like the American Women’s Club (AWC) often hold Halloween parties in the larger cities. Every year the Malmö AWC has a costume party at a local indoor play place and the kids run around in their costumes, play, and get to do a little trick-or-treating by going around to stations where great efforts are made to have some American candy (I’m pretty keen on that part, especially the tiny twizzlers that were available this year). 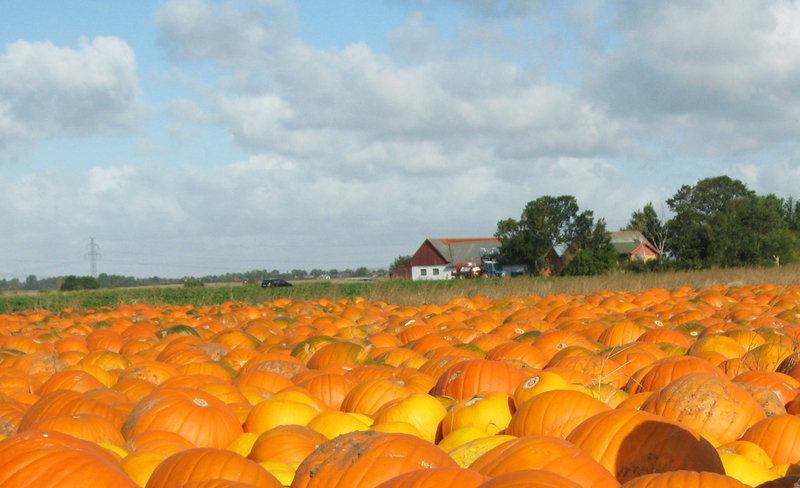 There is a pumpkin patch located in Borgeby which is not too far outside Malmö and you can find pumpkins at many supermarkets. 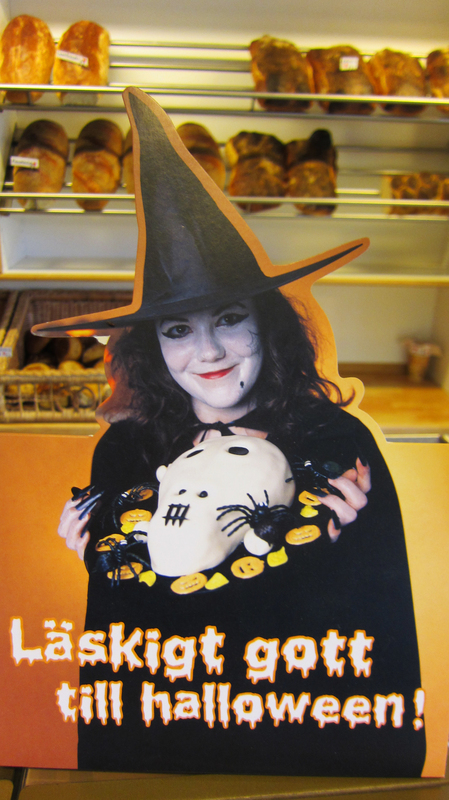 But I found the most fun Swedish interpretations of Halloween at the bakery Konditori Valhall. 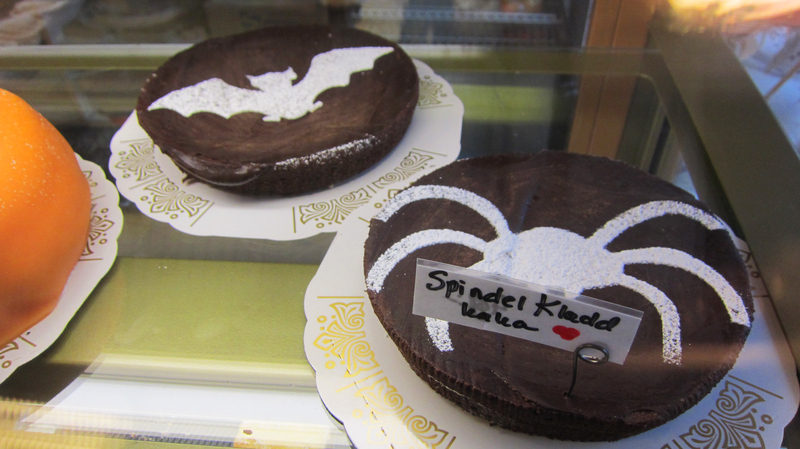 There were tiny prinsesstårta ghosts (spökbakelse) and full size prinsesstårta pumpkins, mother-in-law’s fingers (svärmors fingrar), and spider and bat chocolate cakes (kladdkaka). The person in charge of those powdered sugar spiders needs to be reminded there are eight legs, but it’s cute anyway. So celebrating Halloween in Sweden isn’t quite the same as where I grew up in northern Utah where it was inevitably so cold for trick-or-treating that you had to put a coat over your costume and you still froze to the bone. My kids currently think that Halloween is literally the indoor play place. But we have created our own Halloween memories carving pumpkins and decorating Halloween cookies with friends and I sent my kids off to school this morning with their faces painted like butterflies. One year we aim to plan a trip to the U.S. over Halloween so our kids can experience the true American version. We’ll probably have to take them to the indoor play place to make up for an evening of walking around in the cold, dark, fall air while they go from house to house trick-or-treating. 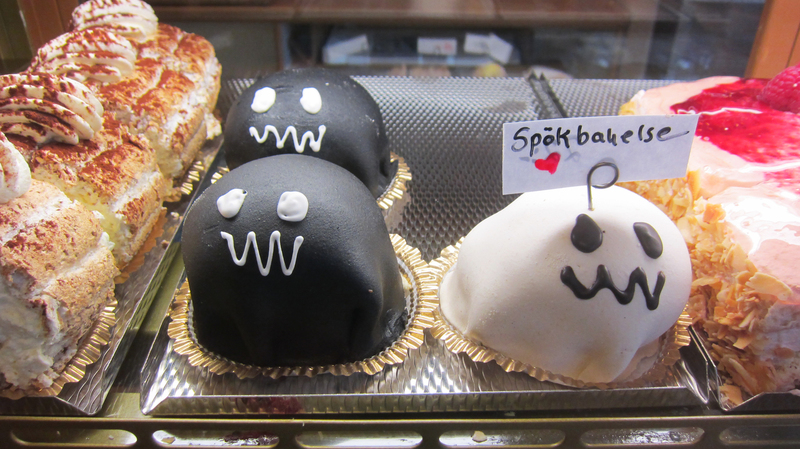 But for today I purchased them each a little ghost pastry, we lit our jack-o-lanterns, curled up together and watched It’s the Great Pumpkin Charlie Brown on DVD (Den Stora Pumpa in Sweden, and Charlie Brown is called Karl) , and in a way it felt a bit more like home. Happy Halloween! We organized trick-or-treating in our neighborhood for the 5th year in a row…if you want me to send you the letter/info we use, I’d be happy to. It’s great, and we get compliments and thank yous from the Swedish parents…they are thrilled that we put it together and it’s SO easy! Sure. I’d love a copy of that letter. It hadn’t occurred to me to organize something of our own in our building, but maybe it would be fun to do in the future. I’d be interested in a copy of that letter too, Maia, if you and lizardek don’t mind. It’s a small village here and we have children that we know quite well living nearby … but nobody came to call over the weekend and we were out at a Hallowe’en walk tonight. The walk was great but Robin is quite disappointed that nobody came to call here! Another aspect that I’d love to promote further is the idea of performing a trick to earn the treat … apparently it was that way in Scotland and Ireland once, and is that way in some areas of the US. So much more appropriate than damaging property etc. Robin has been practising the ‘Steal your nose’ trick for days and has yet to find a victim! Hey Helen, I think I can safely speak for Liz when I say I don’t think she will have a problem with sharing the letter. But don’t count out the trick-or-treaters just yet. From what I understand some people are planning to give it a go this upcoming weekend and maybe you still have a chance to organize something yourself if you are really keen on it. Check the link for people who organize their own trick-or-treating http://yourlivingcity.com/stockholm-guide/trickortreat-swedish-street/. I guess you just have to be on the ready with some Daim or something. 🙂 We never really dealt with the ‘trick’ aspect of things where I grew up. I think someone said ‘trick’ once or twice and we were just dumfounded and speechless, so they caved and just threw candy in our bags. I wouldn’t be too excited about Halloween if it was all horror too. What makes Halloween so great in the USA is that it is the one night that you can dress up as anything that you want to be and no one questions it. I saw several adult super heroes in the grocery store…. As an American who gave away candy last night; I had about 30 children knock on my door. 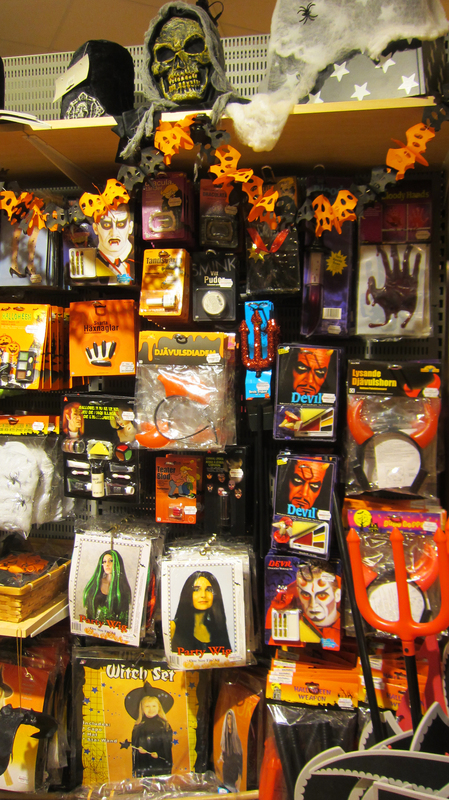 Most costumes where princesses, ninjas, robots, witches, devils, a lady bug and several ghosts. My was a zombie skeleton, but he was in the minority of being “scary”. Vad trevligt med våra bakverk på din blogg! Hey Charlie! Thanks for your nice comments. 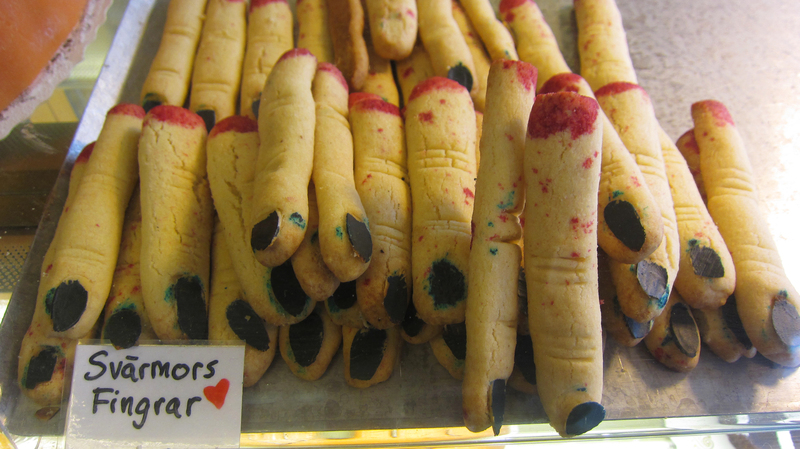 I’m really enjoying your new bakery. We have some Mårtens Gås gäss to try tonight. I couldn’t pass up the six-legged spider comment because my dad is an entomolgist and I know he would have mentioned it right away. I did notice the spiders on the prinsesstårta have eight legs. 🙂 Looking forward to seeing what other fun things you have in your bakery throughout the year. It’s easy to see there is a big difference from the “old” Valhall bakery. Thank you for bringing such lovely, yummy things to the area. Hej Maia. It may be of interest to your readers outside Sweden to know that there’s a Swedish equivalent to Halloween — not exactly the same, more Teutonic than Celtic — called Valborg that takes place in April (“Walpurgisnacht” in German). It too has evening festivities that can become riotous, adults included, but the event overall has a more positive tone to it than Halloween, which has become cute but was originally laden with grim. I lived in Furulund for awhile, on a small river, and walking from bonfire to bonfire in each neighbor’s backyard, exchanging greetings, sipping brandvinn (“fire wine,” a major intoxicant) was heart-warming. Valborg because it begins the spring has another aspect and that is of planting the seed and procreation, which is another good reason for brandvinn. Check it out here: http://www.youtube.com/watch?v=5LoiG8CQHHY/. 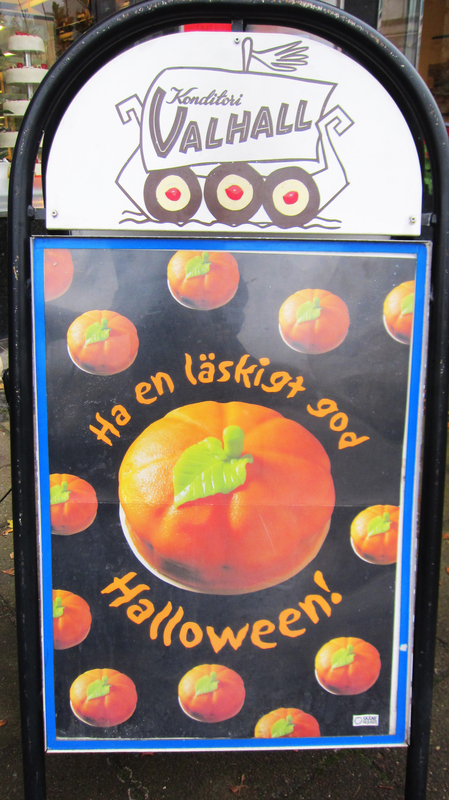 PS The Danes have accepted Halloween wholeheartedly. (As in every cultural dimension, if the Swedes do it, the Danes don’t; if the Danes do it, the Swedes don’t.) Candy and costume sales in DK are going through the roof. Tivoli Halloween is not to be missed although if you’re reading this after I write it, you just missed it. Hi Bob. Thanks for your comments. I actually posted about Valborg earlier this year https://semiswede.com/2012/04/30/valborgsmassoafton/. It’s a fun event, but usually so darn cold and/or rainy in this part of Sweden that it can be a tough one to manage with little kids. I understand that Tivoli’s Halloween fest ended on October 28th, so there is a little bit the Danes have to learn about Halloween. 😉 I was surprised that this year in my 5 year old’s day care class, all but 2 of the kids dressed up. That is a big change from when we first arrived here nearly 5 years ago. Thanks for taking the time to comment. Perhaps our paths will cross again before you take off mid-November, but if not, safe travels.